You can now replace your missing or badly damaged teeth or dentures with a beautiful, natural, and permanent smile in just 1 day while asleep! If you enjoy a juicy bite of a crisp, sweet apple, consider yourself blessed. For thousands of people, this is not a pleasant experience because of the poor condition of their teeth, or because they are denture wearers. Eating should be one of life’s greatest pleasures, yet for many Americans this simply is not the case. They are in pain or unable to enjoy the simple delights most of us take for granted—enjoy chewing our food. I still remember my father’s noticeable struggle at the dinner table. I witnessed first hand how inability to eat a juicy piece of steak or salad affected the quality of his life. My father felt ashamed of his false teeth and suffered at the dinner table night after night. I remember having nightmares about losing my teeth and I began to really pay attention to people’s teeth. While that experience sparked my lifelong passion for finding the perfect replacement for natural teeth, there was no real solution for another three decades, until dental implants entered the arena. Dental implants proved to be completely functional, comfortable, and beautiful as well. It is now realistically possible make dentures history! We live in awesome times. We now have the ability to replace natural teeth in just one day while in deep sleep. Thanks to experiments done by Swedish orthopedist, Dr. Ingvar Branemark, we learned that the hard tissue does not reject foreign objects so long as they are inserted under certain conditions and principles. In fact, our body completely integrates the new body part in a few short weeks and with proper maintenance will preserve it for life. The evolution that Dr. Branemark began over 50 years ago by inserting a metal rod into a rabbit’s femur has blossomed into replacing vital body parts such as teeth, knee and hip in just one day. This knowledge completely transformed orthopedics and dentistry and is changing lives dramatically, everyday. Regrettably, my father passed away before I had the skills to help him, but in pursuing that lofty goal, I have been able to treat tens of thousands of Americans suffering with removable teeth and missing teeth! To find out if dental implants are right for you, please contact Dr. Noie’s office, Unicare Center for Cosmetic and Implant Dentistry at 281-332-4700 or online at www.drnoie.com to schedule your no obligation, complimentary consultation with Dr. Noie. Recently I was talking to a friend about his daughter’s upcoming cochlear implant surgery. He had some real concern about the decision of the insurance company to only fund placement of one cochlear implant as opposed to two. Even though I completely understood his frustration, I also knew how important it is for him that she can hear and be able to distinguish and understand the meaning of various sounds before entering Pre-K. I decided to play devil’s advocate and stress the importance of time that would be wasted in the process. He replied that he is also very concerned about the time factor but he said, “The bottom line is that I don’t want my daughter to settle for half. She deserves better.” I couldn’t argue with that. He was right. If technology can help restore the full function of a lost body part, settling for half is not ethically justifiable. Hours later, while reviewing my conversation, I discovered the parallel analogy between this concept and replacement of missing teeth. As we all know, conventional dentistry did not have a solution for replacement of a missing tooth that would allow restoration of the full range of functions that our teeth provide us, as opposed to addressing only their cosmetic and digestive consequences. Just because we don’t see something, it does not mean that it does not exist or is less significant. 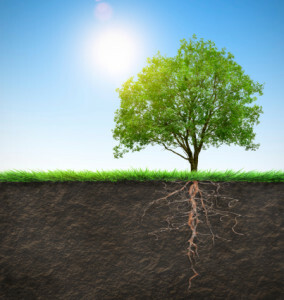 After all, we don’t need to see the roots of a tall oak tree to know they are there and extend far beyond the boundaries of the tree’s hole in the ground. The same analysis holds true for replacing missing teeth. We can’t deny existence of roots because without them our teeth would not stay in our mouth. But is it really necessary to replace them? Well, they are as necessary to longevity of our dentition as a strong foundation is to any building or load bearing architectural structure. Aside from providing surface area to chew our food and the cosmetic and sociological effects of having all our teeth, our teeth also provide mechanical stimulation for the neighboring jawbone, jaw muscles, salivary glands, and gums. This simultaneous stimulation in turn keeps the jawbone dense and strong, the jaw muscles stimulated and toned, and salivary gland stimulated, allowing the presence of ample saliva to help break down food chemically and neutralize the billions of pathogens that invade our oral cavity every single day. There is little argument in the professional community that the dental implant is the most suitable replacement for our natural dentition. It addresses and replaces all the functions that were performed by the tooth that it replaces. Other traditional options may fill the space but they come at a cost. They have to sit on top of the gum. Imagine replacing a load bearing column in your house with a new post that is not even planted in the ground. It is just being held in place by other posts. It may look identical to the way it did before but there is little question that it is not providing the same function. Luckily, thanks to dental implants, when it comes to our oral health and smile, we don’t have to settle for half of what we deserve. Of course not all patients are medically fit to receive dental implants. To find out if you are a suitable candidate, please call Dr. Noie at 281-332-4700 to schedule a one-on-one complimentary consultation with him. Dr. Noie has been in private practice in the Bay Area since 1996. He is a Diplomate of Int’l Congress of Oral Implantologists, Fellow of Academy of General Dentistry, and Assoc. Fellow of American Academy of Implant Dentistry. He has completed his surgical training at New York University as well as Medical University of South Carolina, Temple University, and Wright state University School of Medicine. He completed his oral Anesthesiology training at University of Alabama in Birmingham. He is a member of American Academy of Cosmetic Dentistry. Dr. Farid Noie has a history of always searching the horizon to find a new, better way to treat dental and oral maxillofacial challenges. He also is known for having the patience to wait until that treatment is proven safe and effective. Well, Dr. Noie and Unicare Center for Cosmetic & Implant Dentistry now offers Digital Dentistry. “At last, the age of Digital Dentistry is here, and it’s more exciting than anything I could have dreamed of. That was the last piece of the puzzle. We can now completely regenerate a missing tooth or protect and repair damaged teeth from start to finish,” says Dr. Noie. Q: Can you give us some background on CAD/CAM technology and Same Day Dentistry? Noie: Everything you need for Same Day Dentistry is now under one roof. With the help of digital technology we can envision, capture, and create your perfect smile in just one visit with an astonishing accuracy not possible before. This technology was first introduced in the 1980’s. As with any new technology, there were a few bugs that had to be worked out. The 3D images, using red scanning laser were not accurate, and required use of aluminum silicate powder. The ceramic blocks utilized also were susceptible to fracture. The new generation systems use blue laser rays to scan which is far more accurate. The new ceramic blocks are also re-engineered to be completely monolithic, very similar to cultured pearl. They are so strong and durable that the manufacturers guarantee them to last more than 10 years. The result is a better experience for the patient and an amazingly strong and life-like all ceramic restoration which feels and looks like perfect natural teeth and can last a lifetime. We have come a long way from old style crowns that were temperature sensitive and caused the gum to recede and led to the dreaded visible black line around the crown. A recent comprehensive study at NYU concluded that results seen with new crystal diamond restorations are comparable to the “gold standard.” The study further concluded that performance of these new products has exceeded that of traditional porcelain-fused-to-metal restorations as well as many other all-ceramic restorations. Q: You seem to really enjoy what you do. What are some of the highlights of your very successful and accomplished career? Noie: I consider myself very fortunate to have found my passion and be able to practice it every day. I like to think every patient that I have the pleasure of serving and helping is a highlight, but the happiest moment of my professional life was when I first learned about dental implants (around 22 years ago). Giving my patients sub-standard replacement for their lost teeth never sat well with me. Growing up, I had seen firsthand the profound effect of teeth loss and removable and fixed bridges on my own father. I can honestly say that his oral issues and flawed replacement options available at the time significantly affected the quality of his life. I knew what I had to do and I did it. It took me over six years of post doctoral training in oral & maxillofacial surgery, advanced restorative and cosmetic dentistry to finally be able to help patients with their teeth loss. I had to learn how to regenerate lost bone (guided bone regeneration) and soft tissue that gradually melted away after loss of teeth. It was also very important to me to not only provide my patients with strong teeth, but to make them look beautiful as well. I feel very blessed to witness and be a part of the evolution of restorative dentistry. The dawn of digital dentistry that was just a dream several years ago marked the second most exciting moment in my professional life. My patients now enjoy perfectly fitted chair-side CAD/CAM crowns. I have to admit that early CAD/CAM restorations left a lot to be desired, and I have seen a number of cases that were far from ideal. But, like so many technological advances, reaching perfection took time and experimentation. From my experience, I can conclude that the technology has finally matured. The marginal fit, the contours and the occlusion of these digitally designed and computerized fabricated crowns are just amazing. Q: What is the leading cause of tooth decay and tooth loss? Noie: In my opinion and experience, dental issues are primarily hereditary. Some lucky people are just born with strong resilient teeth while others are genetically predisposed for a lifetime of dental related problems (including my father and myself). Today, dental implants, 3D imaging (CT scan), and digital dentistry have helped even the genetics odds for thousands of my patients. Accidental damage also plays a role. Athletes and people with high-risk professions such as construction workers are obviously more prone to oral damage. Dr. Noie has been in private practice in the Bay Area since 1996. He is a Diplomate of Int’l Congress of Oral Implantologists, Fellow of Academy of General Dentistry, and Associate Fellow of American Academy of Implant Dentistry and Academy of Cosmetic dentistry. He has completed his surgical training at New York University center for Oral & Maxillofacial excellence as well as Medical University of South Carolina, Temple University, and Wright State University School of Medicine. He completed his oral anesthesiology training at University of Alabama in Birmingham. He is a member of the Texas Academy of General Dentistry. Dr. Noie and the Unicare Center for Cosmetic & Implant Dentistry offers Dental Implants, Cosmetic Dentistry, Orthodontics, Invisalign, Bone and Tissue Grafts, High Quality Lumineers, IV Sleep Sedation, and Free CAT scan. They are located at 20814 Gulf Freeway, Suite 40, Webster TX 75598; 281.332.4700; www.drnoie.com.